This recipe was part of late January Tablas Creek wine dinner at 3rd Corner Bistro and Wine Bar in Encinitas, California. The meatiness and fruitiness of the duck dish made a beautiful foil for the similar flavors of the Mourvèdre. Marinate duck breasts for 24 hours. Grill over charcoal with hickory chips for 5 minutes per side. Finish in oven to desired temperature (6-7 minutes at 350 degrees for medium rare). Combine dry ingredients in a bowl. Mix together milk and eggs. Make a well in the dry mix and add wet mix. Fold together to form dough. Push the dough through the holes of a colander, and cook in salted simmering water for 3-4 minutes. They will float. Strain and cool. Sauté spaetzle in butter until crisp and golden, and finish with fresh chives and parsley. Thin the demi glace with the chicken stock. Season with salt and pepper and add in chopped fresh or frozen cherries and honey to taste. Finish with butter. 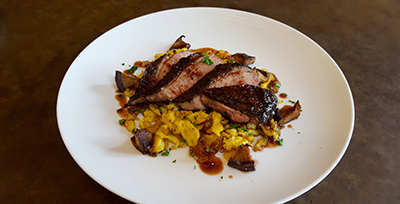 To serve, slice duck breast into thin slices and layer over spaetzle. Spoon over sauce and garnish with parsley and chives.